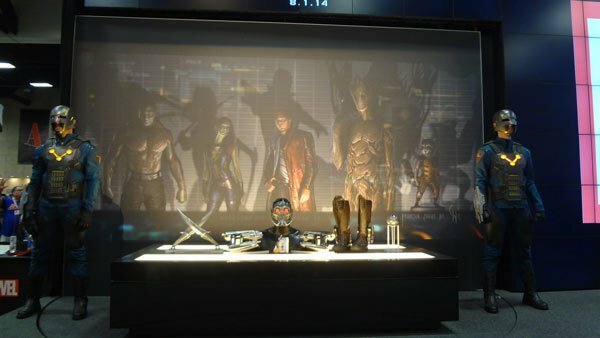 It wasn't a surprise that Guardians of the Galaxy showed up at Comic-Con-- as we've learned in the past, Marvel Studios is a big fan of pulling out the unexpected at Comic-Con, even bringing in the casts of movies that are currently in production on the other side of the globe. What was a surprise, though, is how much the very rough Guardians of the Galaxy footage blew the crowd away, convincing a lot of people who just wren't sure about this outer-space superhero movie that it was worth a look. Now the excitement has spread to the exhibit hall. 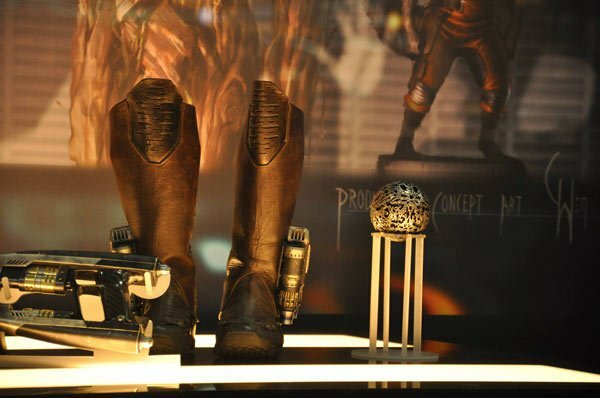 As you can see in the photo above, which Mack snapped this afternoon on the exhibit floor, the Marvel booth on the exhibit floor is showcasing costumes and props from Guardians of the Galaxy, including the helmet worn by Peter Quill a.k.a. 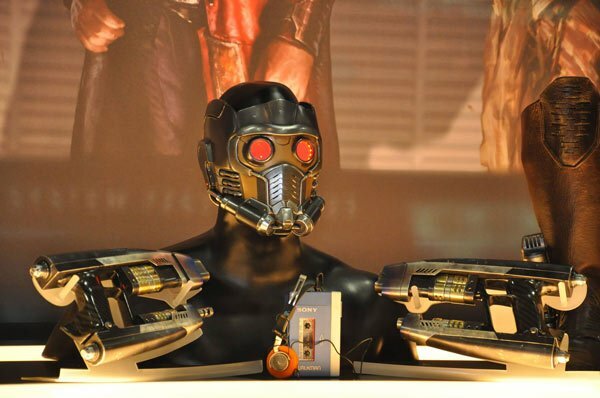 Star Lord (played by Chris Pratt), along with his Walkman and guns. 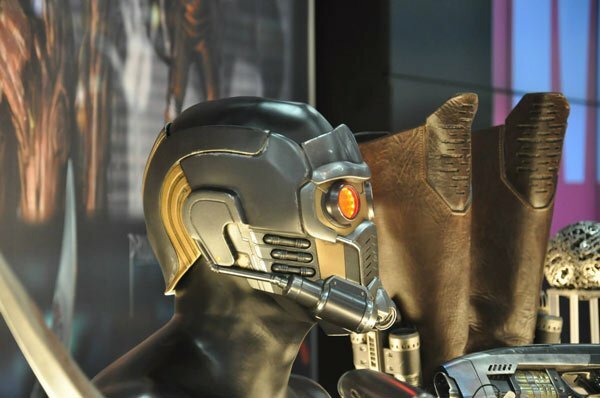 The humans on either side are guard for the exhibit, but wearing the uniforms familiar from the Nova Corps, the intergalactic police force that's a part of the Guardians universe. Rumor got out back in March that the Nova Corps would be part of the film, and this seems to be the first official confirmation of it-- though Gunn doesn't seem to think that's a reveal at all. 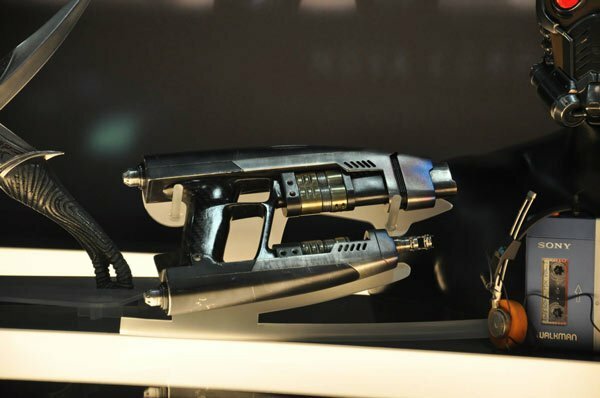 For explanation of what all these props mean check out Sean's detailed description of the footage screened yesterday, which proved to him that "this isn't Family Marvel, that's for sure." (Sean doesn't get into the Walkman, but it's the reason that Blue Swede's "Hooked on a Feeling" gets played over the footage, so it's already developed a following among fans who were in the room). Sean and Eric also got together to record a video blog about their reactions to the footage and everything else that was part of the massive Marvel panel, so you can click here for that. Finally, below you can get some face time with the cast themselves in this video from the panel, which includes the big reveal of Doctor Who star Karen Gillan's brand-new bald head.